The financial and investment industry understands that their clients, both current and future, are using social media. They know their clients are active on Facebook, Twitter, and in the comments of high quality financial blogs. The challenge facing the financial and investment industry is, however, trying to figure out how to leverage social media for their business! One of the major holdups for the financial industry in engaging social media is the heavy legal liabilities that can be associated with sharing information to prospective clients. If you tell someone the wrong thing, it could turn into a huge liability lawsuit. And it’s because of these liabilities, and the lack of understanding on how to maneuver around them, that has been the major road block for the financial industry to engage in social media on a large scale. I propose that the answer to the financial and investment industry’s social media holdup is to leverage the power of “crowdsourcing” – which means allowing the audience to engage in the comments and conversations. And for the individual financial companies to play more of “facilitator” and “information provider”. Starting from a simple blog, any finance or investment firm can share valuable tips and information for free. Financial and investment information is one of the highest volume industries regarding search volume. This means, there’s a lot of people, at any given moment, searching Google for financial and investment information. And having a blog, that 100% free and provides high quality financial tips and information is a great staring point for building an audience for your business. The more content you share, and the more consistently you share it, the more people are going to find your information in Google and your traffic will start increasing on a daily basis. All of the traffic flowing from Google to your blog is considered high quality prospective traffic. The reason is because search traffic represents people’s wants and needs. Why else would be people be actively searching for something unless they had a need to be filled? And each website that people visit from the Google search results has an opportunity to fulfill these wants and needs. Now whether they do it successfully or not is another question. But what is without question is the fact that Google search traffic represents people who are searching to fulfill a need – and that makes them a high quality prospect for the financial and investment industry. Most of the time, people searching in Google are looking for information initially. So by having a high quality blog that shares financial and investment tips and information is a great way to make the initial contact with future clients. Again, the more content you share in your blog, the more exposure you’ll receive in Google and the more traffic your site will receive. 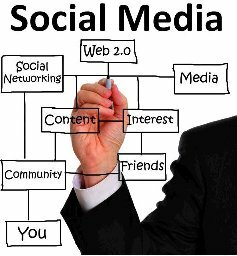 One of the most effective ways to leverage social media is by using it to syndicate your content and information. Some of the most prominent businesses on the web do not use social media to interact with people in discussions, questions and answers, etc… they are using social media simply as a tool for syndication. And this approach might be the solution for the financial and investment industry to get involved with social media without the liability exposure. If you are taking the content that you produce from your blog, which is 100% free, and then syndicating that content throughout Twitter and your Facebook Fan Page. Your Facebook Fan Page and Twitter profile are now simply expanding the audience of your original content. In fact, using this strategy will cause Facebook and Twitter to become large referral sources of traffic to your blog. The simple fact that you are sharing free, valuable financial and investment information from your blog, and syndicating it through Facebook and Twitter, will be greatly appreciated by a growing audience of readers. And one way you can avoid legal liability with this audience is by not engaging directly with this audience in the comments of your Facebook Fan Page, Twitter, and blog. With a large growing audience in the social media platforms, the “crowd” will respond and engage in conversations of their own, without you having to directly get involved. This is what I call “crowdsourcing” in social media. But how does your business benefit from this? Because the more people engage in conversation on your Facebook Fan Page, for example, the more viral marketing exposure your Facebook Page is getting without you having to engage directly with your audience. And what I mean by “engaging directly” is you don’t have to give financial advice, or respond directly to questions asked by your audience. With a growing audience in social media, the audience will respond with their views and opinions (crowdsourcing). And throughout all of these conversations, since they are taking place directly on your social media platforms (your blog, Facebook Fan Page, and Twitter profile), you and your financial business are gaining all of the brand marketing and exposure. By removing your business from direct communication and interaction, you are simultaneously removing yourself from the legal liability of social media. However, because you (your financial business) is the providing the social media platform for people to engage upon, you gain substantial brand marketing exposure. The more you continue sharing high quality content from your blog, and syndicating that content through your Facebook Fan Page and Twitter, the more your audience will grow and the more they will engage each other in conversation – all to your benefit! Social media tools are really quite useless in and of themselves! I mean, there are a lot of people who built Facebook pages that have never returned once they were published. There is said to be approximately a 60% turnover of Twitter users. And a lot of people are even abandoning the thought of starting their own blog. And for all the people that have Facebook pages laying dead in cyber space, and the 60% of Twitter users that never come back, and those that never start their own blog, unfortunately have a grim outlook on winning in their market.